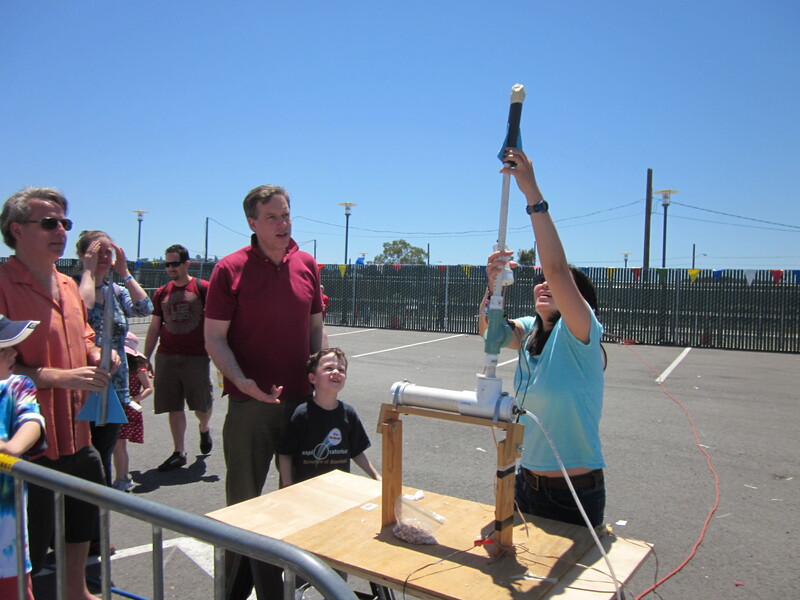 Last weekend we went to Maker Faire in San Mateo. I had never heard of Maker Faire before last week, but it’s a big event that pops up around the country featuring, appropriately, people who make things and the things they make. These are mad scientist kinds of people. Legos, robots, hovercraft, steampunk: that kind of thing. And although May in San Mateo is pretty hot, there seemed to be a heavy emphasis on things that blew fire. My kids were enthralled. This robot dragon shoots flames. Also there are couches inside. 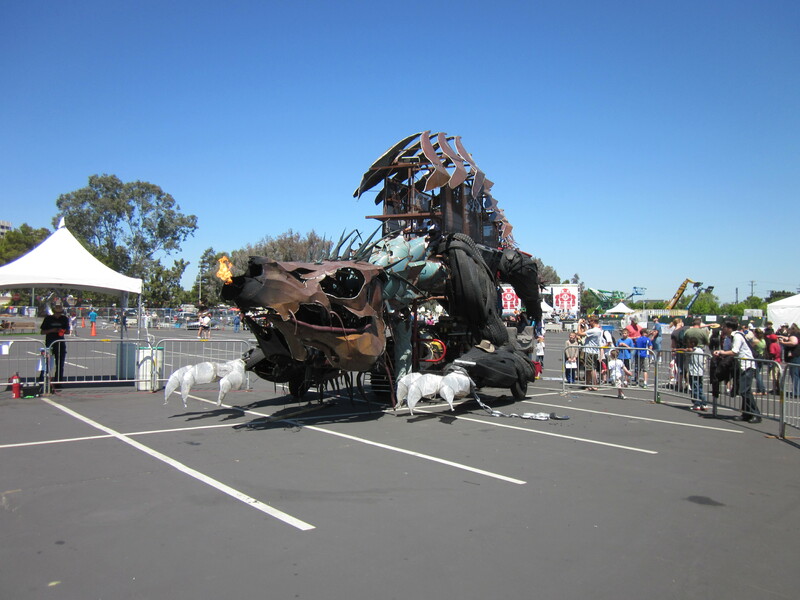 I heard someone say that Maker Faire was Burning Man for capitalists. This seems like a reasonable enough description to me. There was the usual crafty emphasis on display with a swap tent and a fair number of handcrafted giveaways, like the circuit kit my son picked up, but there was an awful lot for sale as well. And where people are buying and selling tech, can overpriced junk food ever be far away? In this case, no it could not. At least there was decent beer. There was a fun-bike mini-velodrome. 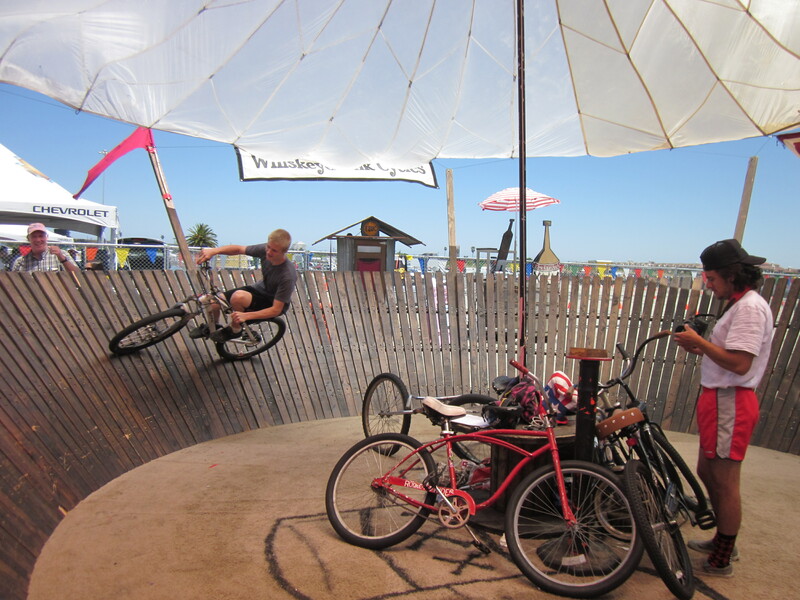 In addition to the Two Penny, the ship-bike, and various other random hodgepodges, all of which evidently could be ridden, there was an area for Cyclecide, where people could try out all kinds of random bikes, including one that hinged in the middle so it wobbled right and left while being ridden and another with odd-sized wheels that bounced the bike up and down like a lowrider. Plus tall bikes, kids’ bikes, side-by-side tandems, and a bunch of others, most of which I lack the imagination to understand or describe. The most impressive of these were entered into the figure-8 pedal-car/bike race, which evidently could get a little rough, as the commentators all seemed to be competitors who’d been sidelined after getting mowed down. My kids were violently opposed to the idea of riding any of the bikes made available for attendees (provided you signed a liability waiver). They wanted to make rockets from paper and blast them from the massive air compressor provided for this express purpose. Admittedly this was a pretty appealing alternative. 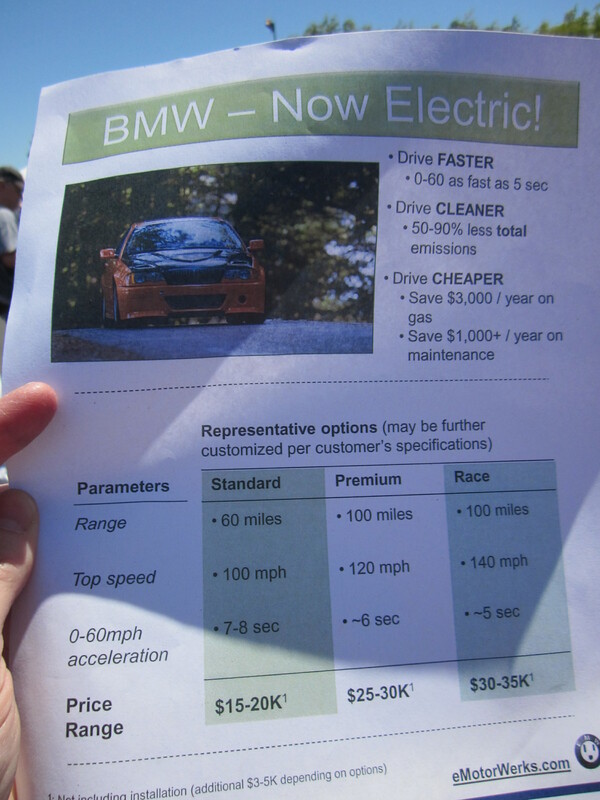 Do you have any idea how many bikes I could buy for the cost of one electric car? Too many, that’s how many. 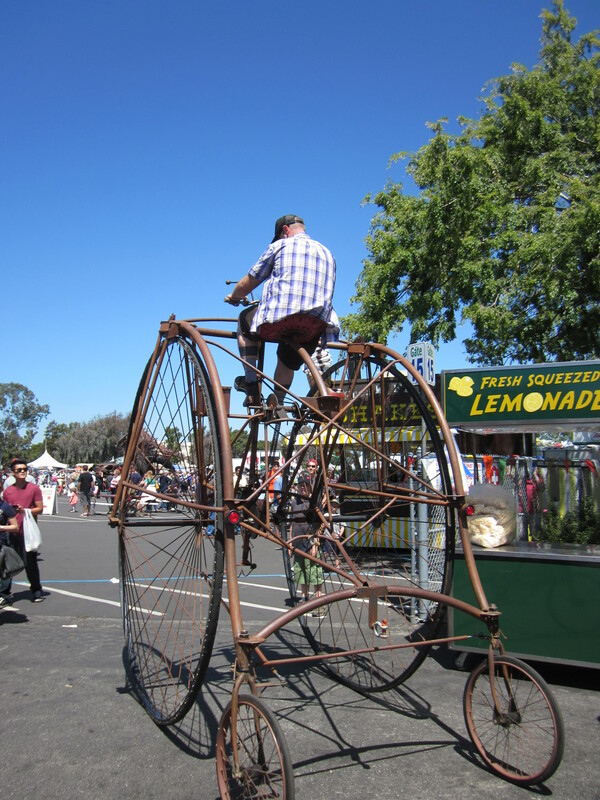 Maker Faire is pretty obviously about promoting alternative transportation, what with the crazy bikes and the hovercraft. (More appealing to the masses, frankly, were the electric cars and motorcycles, not to mention the flaming robots. The bike area was relatively under-populated.) One of the ways this was encouraged was in materials describing how to get to Maker Faire, because the San Mateo fairground is not rich in auto parking, and prices for the parking that was available were high. For the ambitious (and childless) there was a bike train from San Francisco at an estimated time of 90 minutes each way, assuming a fast pace. Or you could bike from CalTrain. 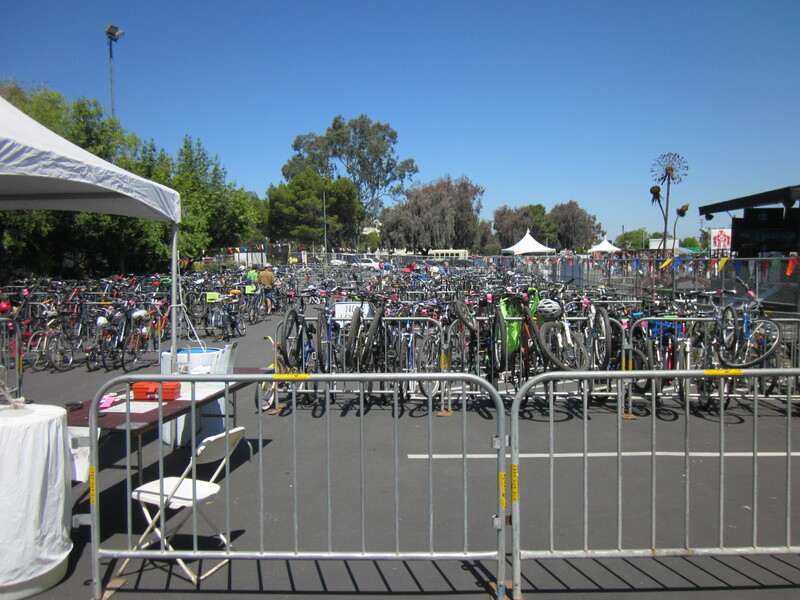 There was also free parking at Oracle, served by a bike route and a shuttle to the event. I tried both. The boat-bike was cool, but I doubt that it actually floats. Unfortunately there is work to be done on promoting alternative transportation that is practical, rather than cool but functionally useless. The shuttle was horrifically late, and there was no shade while we waited. The bike route was unmarked, and the instructions were terrible, so I ended up riding for quite some time on a pretty awful stretch of El Camino Real, a six-lane drag strip down the Peninsula, in the blazing sun, being buzzed and honked at by cars. Good times. A bike ride is a bike ride, and I try to take them as they come and enjoy the experience, but this particular trip made that more challenging than usual. 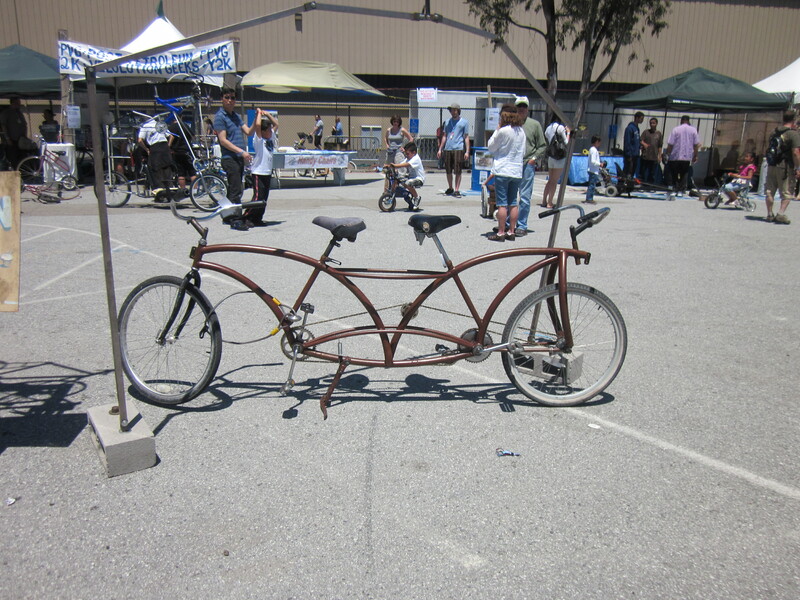 Maker Faire bike parking was packed, although not exactly valet parking. I always appreciate free attended bike parking, but the advertising was confusing. 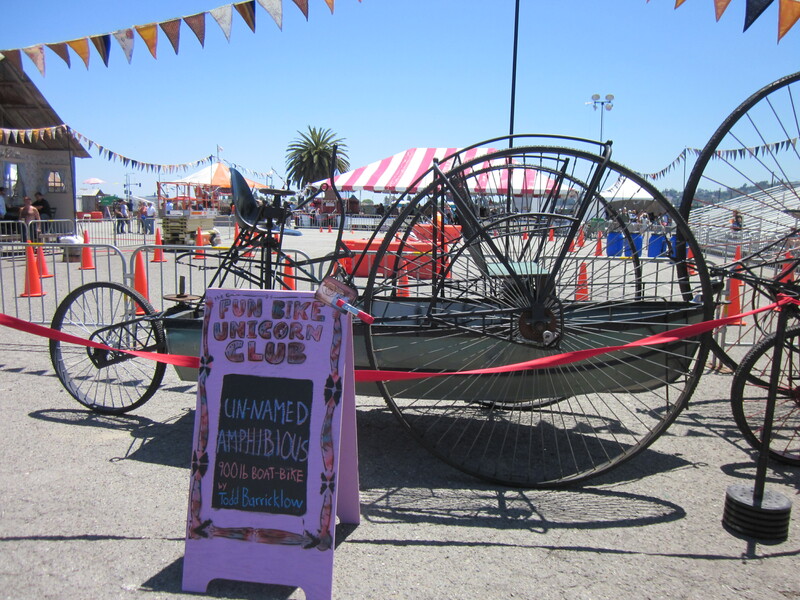 Maker Faire also advertised free valet bicycle parking, which was a misnomer. They meant free attended bicycle parking, but there was no valet. Many cyclists accustomed to the San Francisco Bicycle Coalition definition of valet bicycle parking (which means a person takes your bike, gives it and you matching tags, and parks it for you in a secured area until you come back and retrieve it) were given a lot of blowback from the Silicon Valley Bicycle Coalition members (who defined “valet” as “we’ll watch your bike after you lock it to a portable rack”) about not bringing their own locks. Free attended bike parking is more than fine, but calling it valet parking confused almost everyone. Moreover, although many kinds of wheeled transportation were allowed on the grounds of Maker Faire, security specifically excluded bicycles, even my little Brompton, which is smaller than most strollers, which were out in abundance. And the SVBC folks did not have any knowledge of the supposed bike routes to either the train stations or the parking lots suggested for cyclists willing to ride the last five miles, which is part of the reason I got dumped onto El Camino Real. Apparently SFBC has been spoiling me rotten, so that now I expect valets who are in fact valets and who can give decent directions. Are you sure you want to push that button? 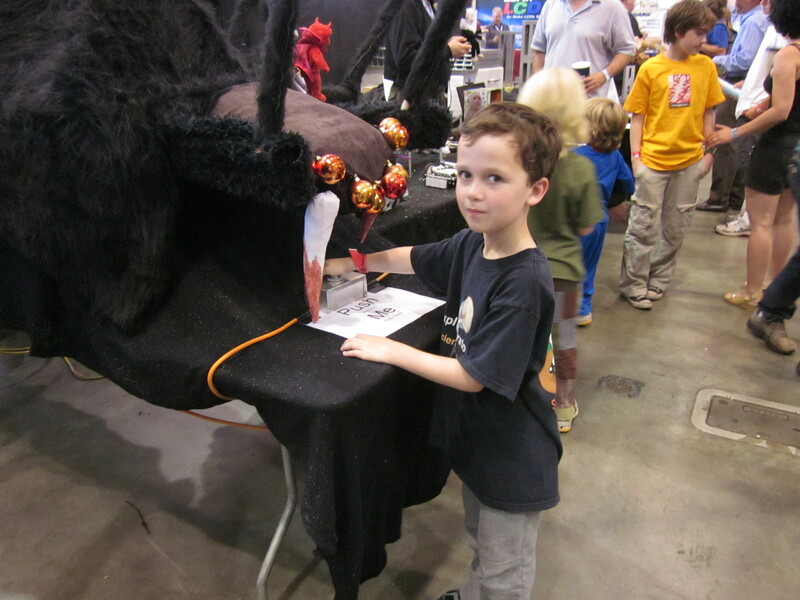 Overall Maker Faire was fun, but kind of overcrowded and ad hoc. I don’t know if we’ll go again. That said, if the bike people who came there, the Fun Bike Unicorn Club (FBUC), ever host their own event, we are totally there.